A group of 17 San Diego-area rabbis issued a statement Wednesday denouncing Rep. Duncan Hunter‘s “fear mongering” attacks on opponent Ammar Campa-Najjar‘s heritage. 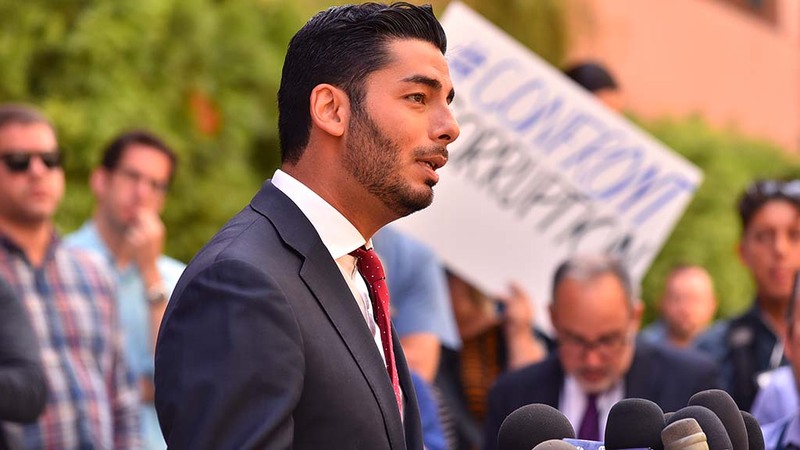 In political ads and speeches, Hunter has accused Campa-Najjar of being Islamic, and Hunter’s father, who preceded his son in Congress, called the Democrat a “security risk.” Campa-Najjar was raised in East County, but his estranged father is Palestinian. The rabbis said their statement was not an endorsement of either candidate in the 50th Congressional District race, but an encouragement of “honesty and civility” in the campaign. “These false fear mongering claims undermine important Jewish values including the commitment to tolerance, honesty and respect. In light of the recent tragedy of Pittsburgh we feel compelled to speak out against hate speech wherever it occurs,” the rabbis said. Those signing included clergy from Congregation Beth Israel, Temple Emanu-El, Temple Solel and Ohr Shalom Synagogue as well as other institutions. Hunter, a Republican who is under indictment for alleged campaign finance fraud, is seeking his sixth term in the largely rural East County district. He and his father before him have represented the area in Congress for nearly four decades.